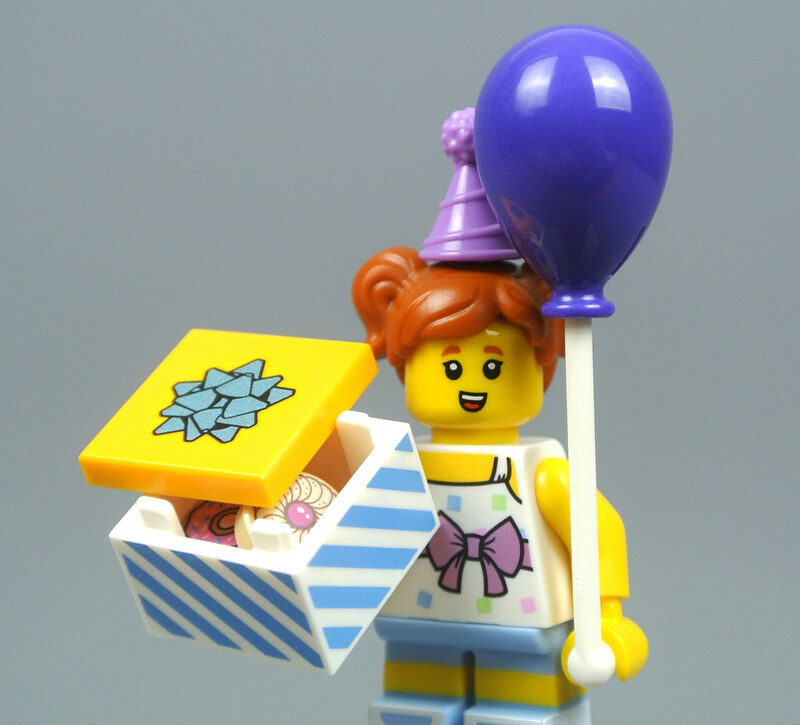 2018 marks the fortieth anniversary of the LEGO minifigure and the Collectable Minifigures range is celebrating that fact in the latest series! 71021 Collectable Minifigures Series 18 consists almost entirely of costumed party guests exhibiting the most outlandish aspects of LEGO minifigures. These seem certain to prove popular given the success of past minifigures wearing costumes and I have been looking forward to them very much. We have decided to divide this review into two parts, the first of which is focused upon such minifigures as the Party Clown, the Dragon Suit Guy and the Classic Police Officer. Animal suit characters have proven consistently popular since the Gorilla Suit Guy appeared in series three and the Elephant Girl is an excellent addition to the collection. Her headwear includes a pair of printed eyes as well as a trunk, large ears and white tusks, all of which look great. I was surprised to find that this element is dual-moulded with white and light bluish grey plastic, ensuring that the tusks are crisply coloured. 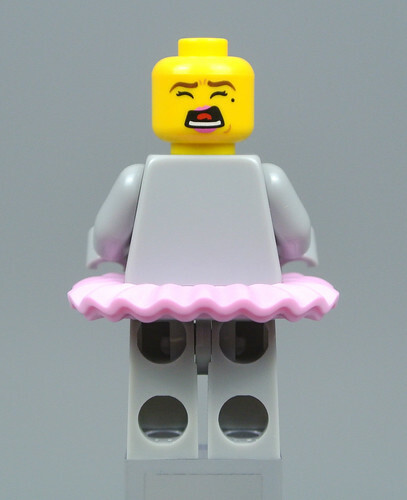 The torso and legs are printed with some simple white highlights and a bright pink tutu is worn around the waist, adding a splash of colour to what might otherwise be a bland figure. Elephant ballerinas first appeared in Disney's Fantasia from 1940 and have since featured in several children's books so are an enduring image today. 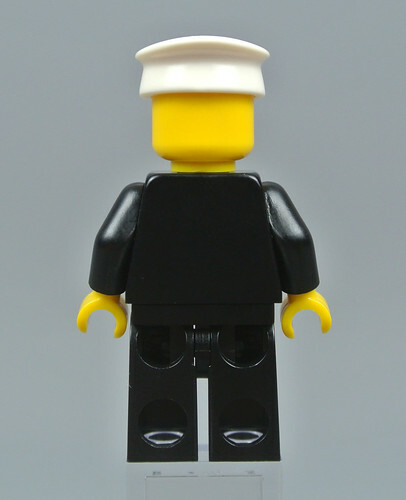 This LEGO rendition is superb and I like the double-sided head which includes a smile and a frightened expression. 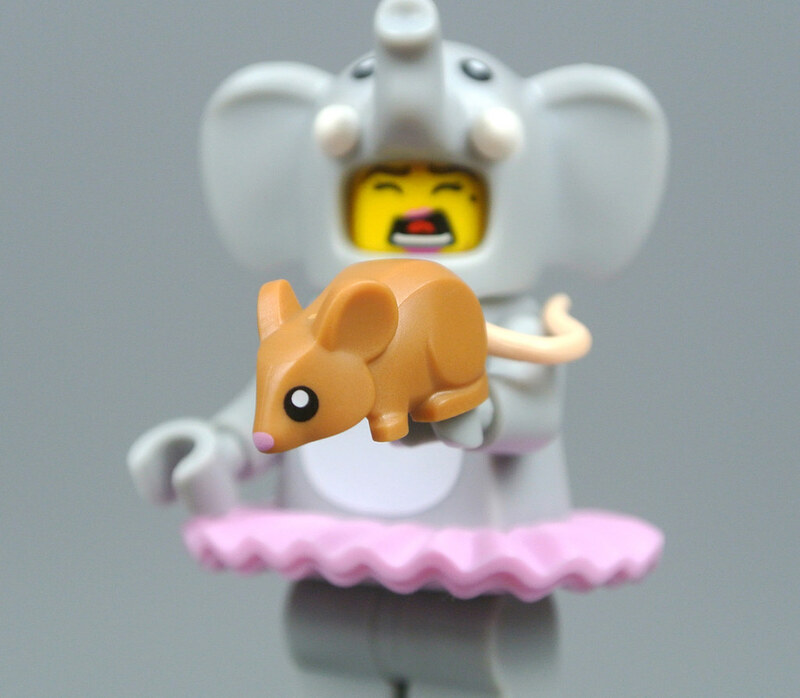 Naturally, the Elephant Girl is frightened of the tiny mouse included! This new piece includes far more detail than the original component, featuring moulded ears along with printed eyes and a pink nose. I love the flexible tail and the mouse fits perfectly onto a studded surface so it can be held in a minifigure's hand, as shown below. 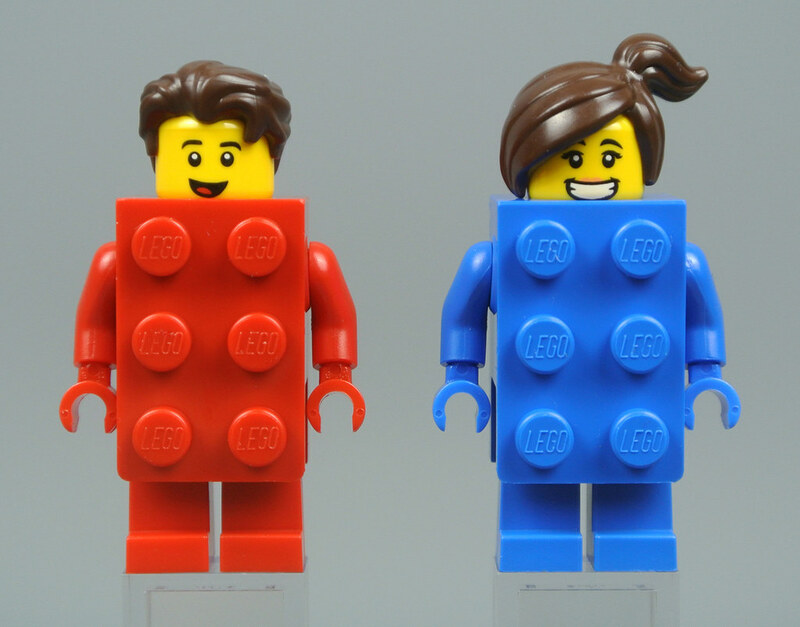 The Brick Suit Guy is dressed as a red 2x3 brick which fits remarkably well with the proportions of a standard minifigure. This costume matches real 2x3 bricks almost exactly, with 'LEGO' embossed on each stud as well as two tubes on the underside. These are much shallower than those inside a real brick but you can still attach other LEGO pieces to the front and back of this minifigure so there is considerable potential for customisation. 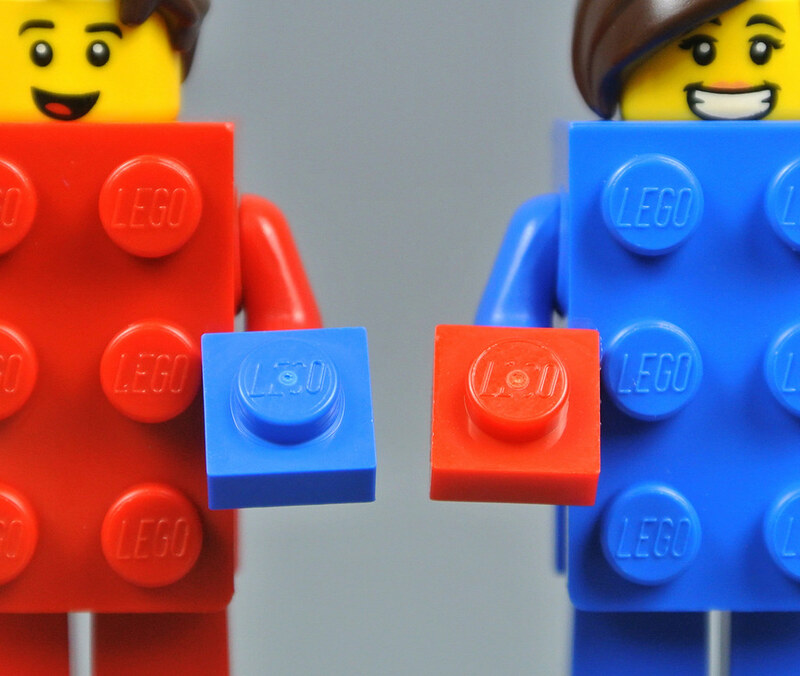 A corresponding blue 2x3 brick is worn by the Brick Suit Girl. The head fits to a recessed pin on top of the brick while the legs slot underneath. Unfortunately, the costume restricts the articulation of the legs to some degree, although you can still create a nice walking pose. I like the grinning expressions on each head and the textured hair pieces, both of which are new in dark brown, look marvellous. Each figure comes with a single 1x1 plate of the opposing colour. These provide an attractive contrast with the costumes so are very useful for display, whether they are being held by the minifigure or are attached to the studs on their brick suits. 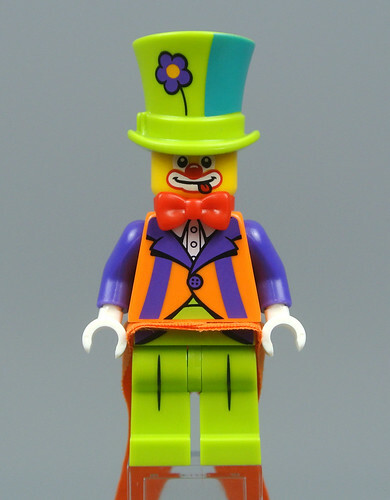 The Collectable Minifigures range has included a number of brightly coloured characters but none more so than the new Party Clown! 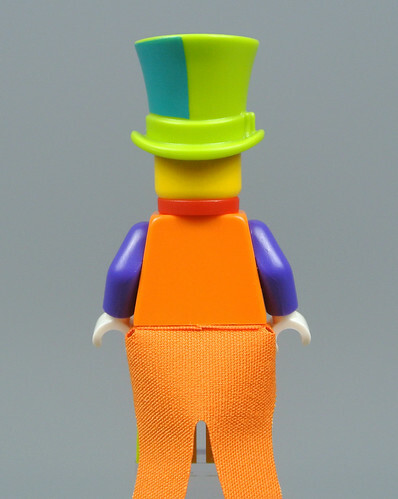 This flamboyant minifigure wears an incredibly colourful costume which consists of a lime green hat, a red bow tie, an orange and purple jacket and lime green trousers. The hat was created for The Penguin in The LEGO Batman Movie but looks equally majestic here with a teal stripe and floppy flower. I am also very pleased with the printing on the torso and legs, although the back of the torso has been left blank which seems a shame. Nevertheless, the long fabric tails fitted around the waist look superb in orange and I like the traditional make-up on the clown's face, complete with a bright red nose and a delightfully cheeky smile. 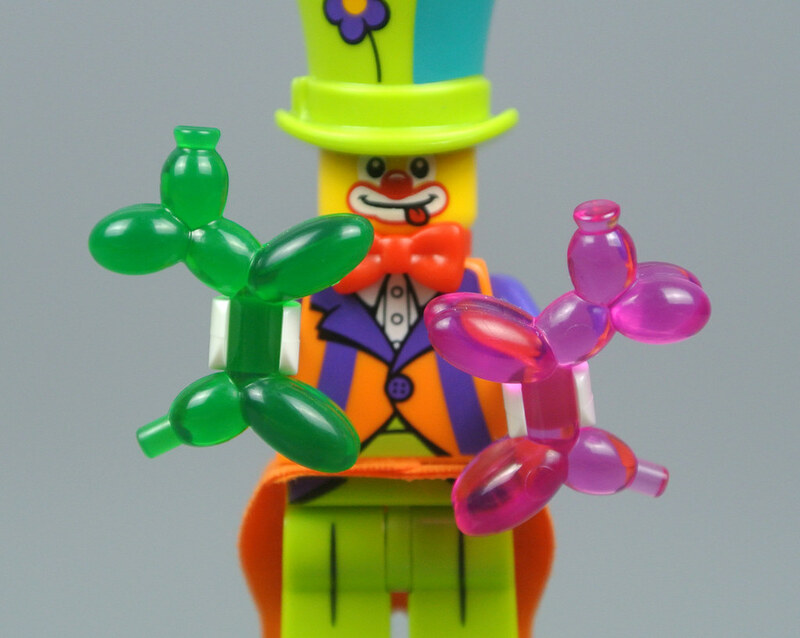 Two balloon animals complete the Party Clown, cast in trans-green and trans-pink. These accessories include fantastic moulded detail so look incredibly realistic, featuring bulbous ears, a nose, four legs and even a narrow tail where the balloon has not been blown up all the way! 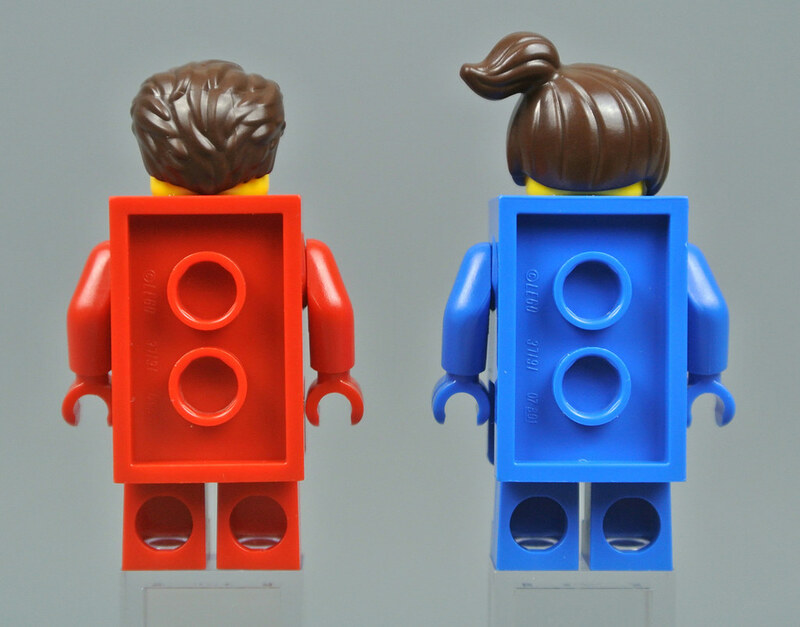 The body is the width of a standard bar so fits neatly into a minifigure's hand and they can stand up quite easily as well. 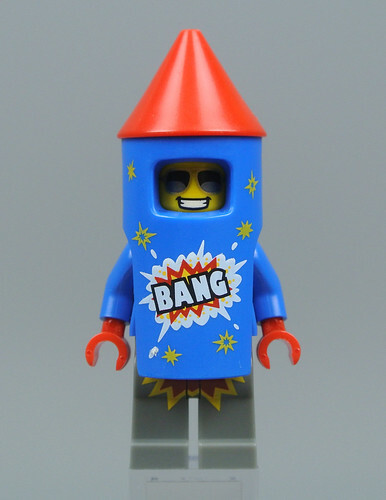 The Firework Guy wears a colourful rocket costume which fits over his head and torso. I like the stars printed on both sides of the cylindrical body and the red cone on top looks nice, with a tiny pin hole for attaching a party hat or other compatible accessories. The explosive flames printed on the legs line up correctly with the rocket but they could have extended a little further in my opinion as the flames are quite difficult to see from certain angles. Moreover, the sunglasses and confident grin printed on the head seem strange for a character dressed as a firework. Perhaps a worried expression would have been more suitable, at least as an alternative to the smile. 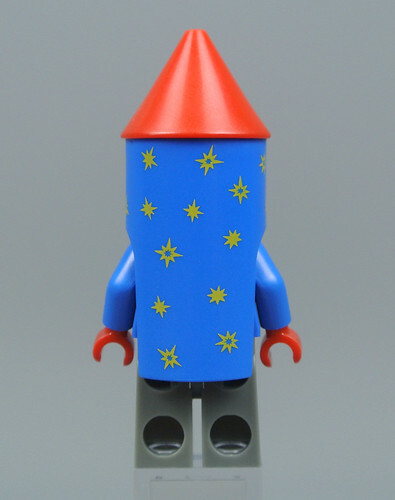 This is still a fun minifigure though and I particularly like the red gloves which match the colour of the cone. 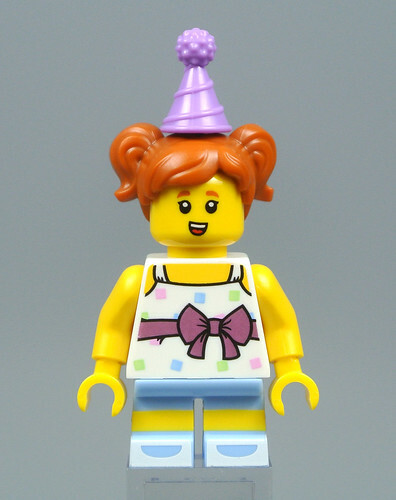 This Collectable Minifigures series also includes a couple of party guests who are not in costume, the first of whom is the Birthday Party Girl. I like her new dark orange hair piece which includes plenty of textured detail as well as a pin hole for attaching a party hat. The head is decorated with matching dark orange eyebrows and a lovely smiling expression. The patterned top looks great too, featuring colourful squares on the front and back as well as a pink bow around her waist. Dual-moulded legs are used to represent shorts or a skirt and white shoes are printed on the feet, beautifully complementing the matching top. Unfortunately, the shoe designs do not continue around the back of the feet but they are present on the sides so look good when viewed from most angles. The Birthday Party Girl comes with two brand new accessories. Her balloon is joined to a white string which is made from a slightly flexible plastic and includes a hand grip at the end, allowing her to hold the balloon in different positions. The present consists of a printed 2x2 tile and a new box element which is the same size as a 2x2 brick. They fit together nicely and I like the stripes printed around the sides of the box as well as the sweets inside. 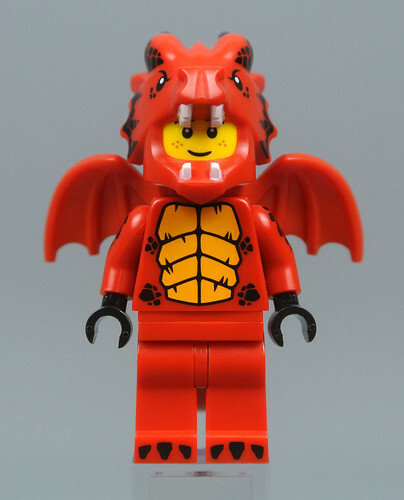 Many fans were drawn to the Dragon Suit Guy when these minifigures were revealed at the New York Toy Fair and it does not disappoint in my opinion. The dragon headgear looks very intimidating, particularly in conjunction with the shouting expression underneath and the large wings attached around the neck. A smile is printed on the other side of the head and rows of black scales adorn the frill, terminating with two black spines towards the rear. These designs continue onto the front of the torso and the arms while the feet are printed with black claws. 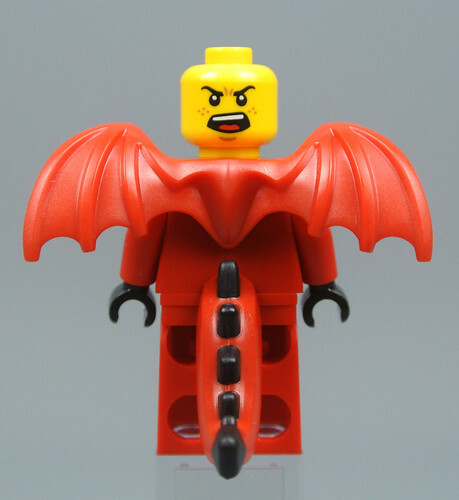 The ribbed wings were originally cast in light bluish grey for the Monster Collectable Minifigures series but look equally impressive in red and I like the tail, complete with black spikes, which fits between the torso and the legs. It is perhaps a little disappointing that the legs do not include black scales like the arms but I am still satisfied with this figure. Collectable Minifigures often push the boundaries of minifigure design and have introduced many new parts since 2010. 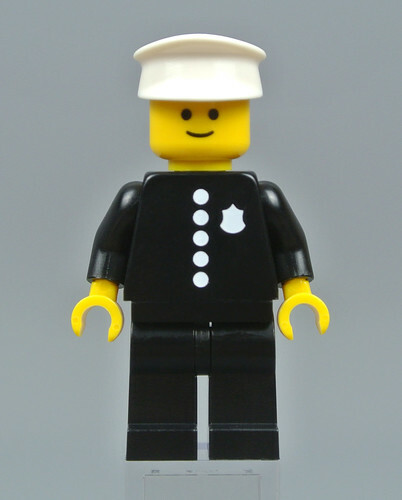 The contrasting style of this Classic Police Officer is therefore very striking and I believe he represents a perfect celebration of the LEGO minifigure. Forty years have passed since 600 Police Car, from which this figure takes inspiration, was released and it is wonderful to see the classic smile making a return alongside a torso which is printed with nothing more than a row of buttons and a badge. These designs are simple by the standards of today but represent an important achievement in LEGO's history. 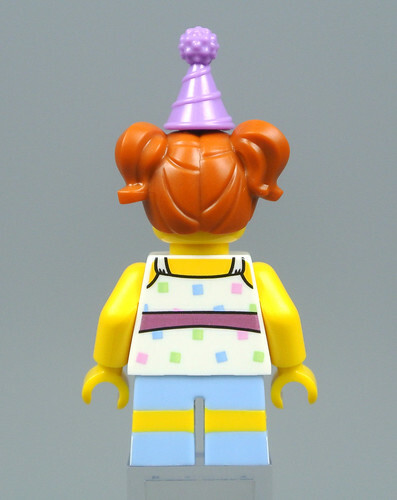 It is worth noting that the torso on the original minifigure was decorated with a sticker rather than a print but I am pleased that the graphic designers have chosen to use a printed piece on this occasion, even though a sticker would have been more authentic. 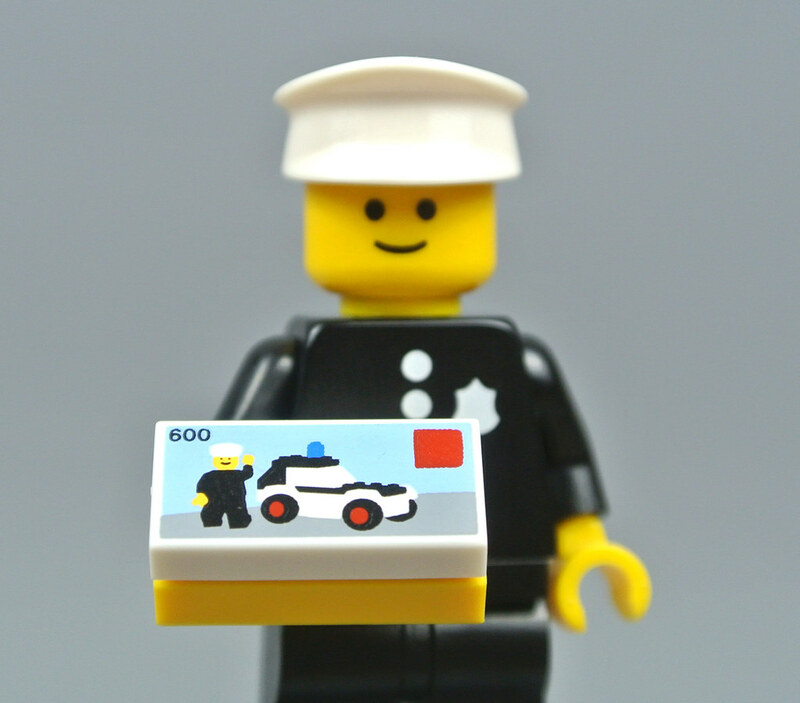 The Police Officer comes with a printed 1x2 tile depicting 600 Police Car. This is a delightful accessory and I am impressed by the intricacy of the design which even includes the figure's smiling expression on the box! 71021 Collectable Minifigures Series 18 is off to an excellent start. Past costumed characters have been among my favourite Collectable Minifigures to date and the first half of this series is certainly a match for those which have gone before in my opinion. The limited availability of the Classic Police Officer is somewhat disappointing but a quantity of one in each box should allow most people to add this excellent figure to their collection. Great review as always! IMO the Party Girl is Magnificent. Love the balloon and sweets. The firework guy feels rather redundant to me. I have that classic police officer and it doesn't have a sticker for the badge on mine. I wonder when that was changed. About the police’s guys lego-box: it got a yellow 1x2 under white 1x2 tile w car print. I remember that the old Lego-castle and pirate sets where yellow inside the boxes. Maybe thats why! 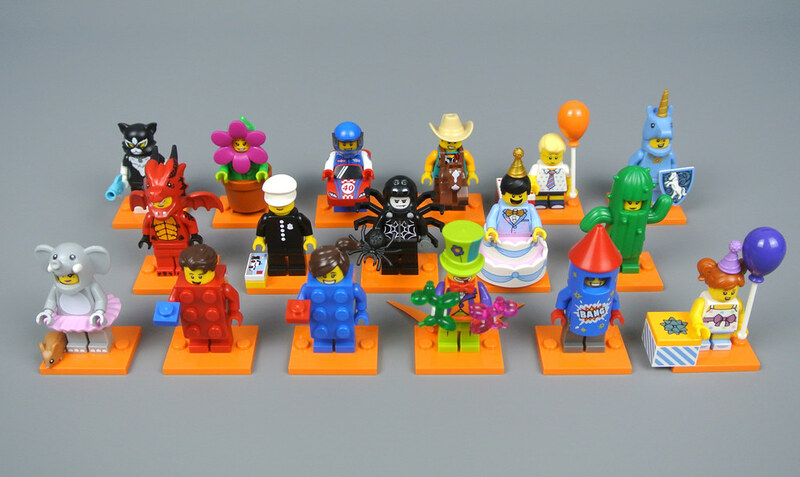 Is this the first series with orange baseplates? Wonder if TLG is gonna start changing the color for each new series. @Huw @CapnRex101 a suggestion for minifigure reviews: please start including side views when the figures have side printed details (seems to becoming a more common occurrence as the series evolve), and it would be nice to have images of costumed figs with the costume shell removed so we can see what the torsos look like, e.g. Firework Guy. I think TLG are really back on the ball for this series and i think pretty much all the figs here are fun, bright and inventive. Side view would be nice as darkstonegrey says .... as hard to tell the bricksuit girl/boy configuration. If you have time of course. Thanks for the review. Looking forward to the next half. This series rocks! Especially the dragon guy! An excellent review of an excellent minifigure series! Can't wait for part 2! @darkstonegrey and waylander - Thank you for the suggestion. I have added a couple of photos to this review and have made sure to includes photos from other angles where necessary in part two. With regard to the Firework Guy, his torso is plain blue. How much does it cost LEGO to produce a new minifigure? I love the clown and the Dragon so, will a contest be made where one can win these two? What figs out of the series do you all feel under the "costumes" theme? I know its a costumes themed series, but which ones would you consider displaying with Lizard Suit, Hot dog suit, Shark suit, etc? How do you purchase the large 60-fig boxes? This series gets a 6/10 lego. I was thinking about that too. To me, the actual "costumes" or "suits" in this series are Elephant Girl, Firework Guy, Dragon Suit Guy, Spider Suit Boy, Cactus Girl, Cat Costume Girl, Unicorn Guy and Flower Pot Girl. The rest (girl, boy, clown, cop) are not costumes at all or something close (cowboy, cake man, red/blue brick). Stellar series. TLG knocked it out of the park with this one. First time I might try to purchase a full box. Even having read this well written review, this is still the first CMF series that I have zero interest in getting any of! How thick is the brick suit, looks like about 4 plates? Do you consider any from the monsters themed collection "costume" I know some consider the tiger woman and plant man..
@LuvsLEGO_Cool_J: I have set 600 as well and my police officer also came with a printed torso. But I also have other police sets from the era, and sometimes the figure came with a sticker, sometimes with a print. Seems a little random in hindsight. As for the new CMF series: I am beginning to warm up to some of the figures, but the series on the whole is still not my favorite of them all. 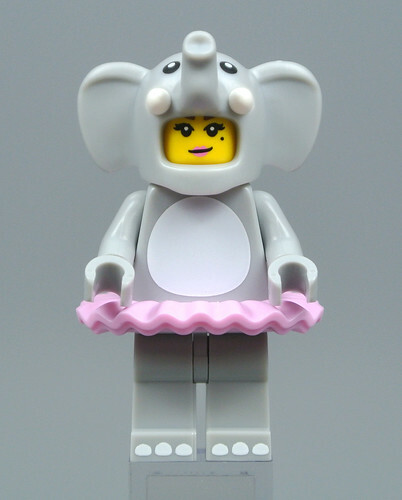 I quite like the Elephant Girl and the Clown, but mainly because of the excellent accessories (mouse, ballon animals) and not because of the figures themselves. Shame about the rarity of the classic police officer - and the price of the packs of course. Firework guy - liar, liar, pants on fire. I am liking this series after a few 'meh' figures from the previous series. My only quibble is the 1 per box on the police officer!